In the bowl of a food processor, add the flour, salt and sugar and pulse to combine. Add the butter and process 8 – 10 seconds until the mixture resembles course meal. When you’re ready to make the quiche, remove the dough disc from the Ziploc bag and place on a lightly floured surface. Roll out the dough as quickly as possible working from the center out with each roll. The dough should be about 2″ larger all around than your pan. Lay the dough in the pan and press the dough lightly into the bottom of the pan, lifting the edges and working it gently down into the mold. Trim off the excess dough by rolling the pin over the top of the mold. Cook the meat; drain and crumble. If using the veggie sausage, thaw the sausage and cook in about 1 tablespoon oil. Spread the butter over the pie crust. Spread the meat evenly over the butter, and then spread the spinach over the meat. Spread the cheese evenly over the entire pie. In a large bowl, whisk together the eggs, cream, and seasonings. Slowly pour the egg mixture into the pie dish covering the meat, spinach and cheese. Place the pan on a cookie sheet. Bake at 375 degrees for 25 – 30 minutes or until golden brown and just set. You don’t want to overcook it. Remove from the oven and let stand for 10 minutes before serving. Hostess Tip: There are several ways to make this a quick and easy recipe. First, if you don’t want to bother with a homemade pie crust, use a prepared one from the store. 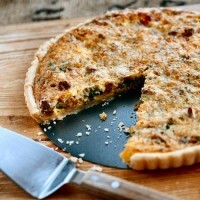 I do this all the time and the quiche still turns out great. If you forget to thaw the spinach ahead of time, you can defrost it in the microwave. Just cut a slit in the box, place in a microwavable bowl, and cook on “defrost” for several minutes. Then, squeeze the box until all the liquid comes out. At this point you can just pull the paper away and you’ll have thawed spinach that’s ready to use. You’ll want to make sure the spinach is well drained. I find that I can squeeze handfuls in-between paper towels to get any excess liquid out. And, you can easily overlap your steps. Defrost the spinach while you cook the meat. And, buy cheese that’s already grated. These are shortcuts that will allow you to prepare it quickly without impacting the outcome. Oh, and I LOVE this tart pan ! It’s so easy to use.